Ninja JaJaMaru-kun (忍者じゃじゃ丸くん, ninja jajamaru-kun) is an action game released in Japan on November 15, 1985 by Jaleco for the Nintendo Entertainment System and in 1986 for the MSX. It was released for Nintendo's Japanese Virtual Console on December 26, 2006 and in PAL regions on September 21, 2007 as part of Ninja Week for the Hanabi Festival promotion. It was released on the North American Virtual Console on October 22, 2007 and was the first time the game made its release outside Japan, in their respective regions. The game stars the little brother of Ninja-kun from Ninja-Kid. Princess Sakura has been kidnapped by Damazu-Dayuu, and because Ninja-Kun is away on a journey, the task falls to young Jajamaru-Kun. In the game, the player starts with three lives and can only run, jump and throw shurikens. The game is divided into stages, each with four floors and eight enemies. Sakura-Hime and Damazu are placed, unreachable, at the top of the screen. Enemies use various projectiles, one of which will cause the player to lose a life. If JaJaMaru-kun lands on top of an enemy, it will simply be temporarily stunned and vice versa. Once an enemy is defeated and offscreen, a spirit will appear and ascend to the top of the screen. It can be collected before it has disappeared to receive points, which vary depending on the enemy. Sakura will sometimes drop petals that the player can collect, and Damazu will sometimes run around, dropping bombs. To advance to the next stage, the player must defeat all eight enemies by using shurikens. 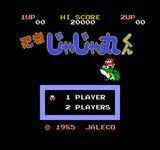 Source: Wikipedia, "Ninja JaJaMaru-kun", available under the CC-BY-SA License.